Foraging behavior and the mechanisms that regulate foraging activity are important components of social organization. Here we test the hypothesis that brood pheromone modulates the sucrose response threshold of bees. Recently the honeybee proboscis extension response to sucrose has been identified as a ”window” into a bee’s perception of sugar. 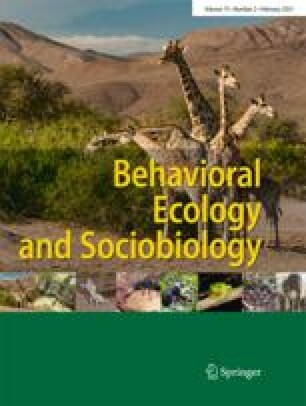 The sucrose response threshold measured in the first week of adult life, prior to foraging age, predicts forage choice. Bees with low response thresholds are more likely to be pollen foragers and bees with high response thresholds are more likely to forage for nectar. There is an associated genetic component to sucrose response thresholds and forage choice such that bees selected to hoard high quantities of pollen have low response thresholds and bees selected to hoard low quantities of pollen have higher response thresholds. The number of larvae in colonies affects the number of bees foraging for pollen. Hexane-extractable compounds from the surface of larvae (brood pheromone) significantly increase the number of pollen foragers. We tested the hypothesis that brood pheromone decreases the sucrose response threshold of bees, to suggest a pheromone- modulated sensory-physiological mechanism for regulating foraging division of labor. Brood pheromone significantly decreased response thresholds as measured in the proboscis extension response assay, a response associated with pollen foraging. A synthetic blend of honeybee brood pheromone stimulated and released pollen foraging in foraging bioassays. Synthetic brood pheromone had dose-dependent effects on the modulation of sucrose response thresholds. We discuss how brood pheromone may act as a releaser of pollen foraging in older bees and a primer pheromone on the development of response thresholds and foraging ontogeny of young bees.